Flight EA401 departed New York-JFK at 21:20 EST for a flight to Miami. The flight was uneventful until the approach to Miami. After selecting gear down, the nosegear light didn't indicate 'down and locked'. Even after recycling the gear, the light still didn't illuminate. At 23:34 the crew called Miami Tower and were advised to climb to 2000 feet and hold. At 23:37 the captain instructed the second officer to enter the forward electronics bay, below the flight deck, to check visually the alignment of the nose gear indices. Meanwhile, the flight crew continued their attempts to free the nosegear position light lens from its retainer, without success. The second officer was directed to descend into the electronics bay again at 23:38 and the captain and first officer continued discussing the gear position light lens assembly and how it might have been reinserted incorrectly. At 23:40:38 a half-second C-chord sounded in the cockpit, indicating a +/- 250 feet deviation from the selected altitude. None of the crewmembers commented on the warning and no action was taken. A little later the Eastern Airlines maintenance specialist, occupying the forward observer seat went into the electronics bay to assist the second officer with the operation of the nose wheel well light. At 23:41:40 Miami approach contacted the flight and granted the crew's request to turn around by clearing him for a left turn heading 180 degrees. At 23:42:05 the first officer suddenly realized that the altitude had dropped. Just seven seconds afterwards, while in a left bank of 28deg, the TriStar's no. 1 engine struck the ground, followed by the left main gear. The aircraft disintegrated, scattering wreckage over an area of flat marshland, covering a 1600 feet x 300 feet area. Five crew members and 94 passengers died in the accident. Two passengers died more than seven days after the accident as a result of their injuries. PROBABLE CAUSE: "The failure of the fight crew to monitor the flight instruments during the final 4 minutes of flight, and to detect an unexpected descent soon enough to prevent impact with the ground. 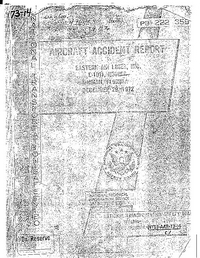 Preoccupation with a malfunction of the nose landing gear position indicating system distracted the crew's attention from the instruments and allowed the descent to go unnoticed." Distance from New York-John F. Kennedy International Airport, NY to Miami International Airport, FL as the crow flies is 1745 km (1091 miles).